We make brilliant ideas look good, so behind every beautiful design lies a tailored strategy to attract, engage and convert business. We love to brainstorm creative ideas with potential clients. Visit our Worcestershire studio and you’ll find a creative space to bounce ideas around. Creativity is at the heart of everything we do. From the formal to the bizarre, we’re ready to sprinkle our creative dust on just about any project. We’ll help your business stand out from the crowd and ensure that your marketing efforts are generating a real return. Our clients typically enjoy an improved web presence, enhanced brand identity, and a tailored service to suit their budget and goals. We begin new projects with a coffee & chat, the first objective being to understand your business’s marketing goals. Once we know these we can work towards developing a strategy to smash them! Our objective is to wow the people we work with, producing work that exceeds their expectations and elevates their business to the next level. Whether it be a new website, piece of PR or new company branding – our aim is to blow our clients’ minds! Of course behind every pretty design is a strategy to generate business and produce growth. We’re not here to make a quick buck. Our intention is to partner up with businesses and provide ongoing support as they grow. If we find that we’re a good fit (stage 1) and we’ve blown your mind (stage 2) then we like to think that our understanding of your goals and broad skill offering will make us your go-to creative source when you need it. We love creating and developing brands for clients, from startup ideas to established business. Our branding service includes logo design, developing colour palettes, typography, printed literature, signage, online marketing materials and more. We are highly experienced in creating, developing and maintaining websites. We have produced all manner of business websites from beautiful basic brochure sites to multi million pound ecommerce machines. 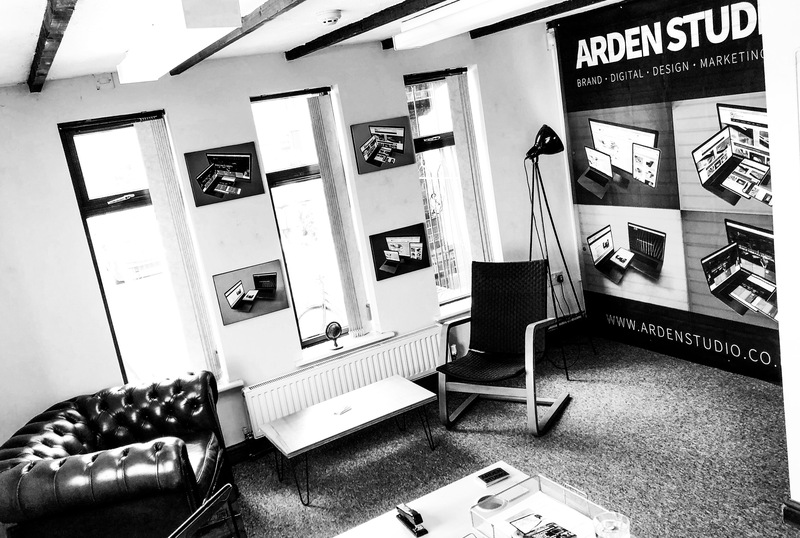 Let Arden Studio revolutionise your web presence. We can offer you many of the benefits of employing a marketing manager without the full time commitment. Our marketing consultancy service is aimed at small to medium businesses that need some marketing direction, ideas and someone to roll their sleeves up and ‘do’. We can manage your business PR and social media activity. We will craft compelling copy and create a real buzz about your brand, ensuring that your story is heard in the places that it needs to be. Let us build your tribe of followers and help convert them into customers. We help businesses get their commercial proposition in front of potential customers through eye-catching graphic design work. We can produce business cards, business stationary, flyers, brochures, signage, promotional work, online marketing designs, and more. You have a stunning website and are ready to take on the world, but what are the next steps in generating sales, website traffic, potential customers, sales and enquiries? We can help you create a tailored digital marketing strategy that produces a real return on investment. We’d love to hear from you! Get in touch for a quote or to discuss ideas.